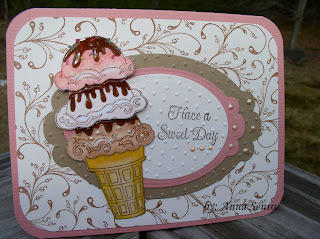 A Peek Inside The Creative Corner: Say Yes to Three Scoops of Ice Cream! I have been truly enjoying the usually warm weather we have been having by opening windows and getting rid of that old winter stale air, putting laundry outside and even eating lunch on the deck the other day! What a treat! 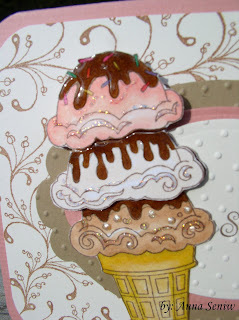 And speaking of treats, the Impression Obsession order came in and I just had to use the new stamp, Three Scoops. I had so much fun coloring it and putting it all together; all at the same time dreaming of summer! I colored the image with my Copics and paper pieced the 2 top scoops. The middle scoop only has one layer of foam tape where as the "strawberry" scoop has double foam tape. I wanted it to have more dimension. 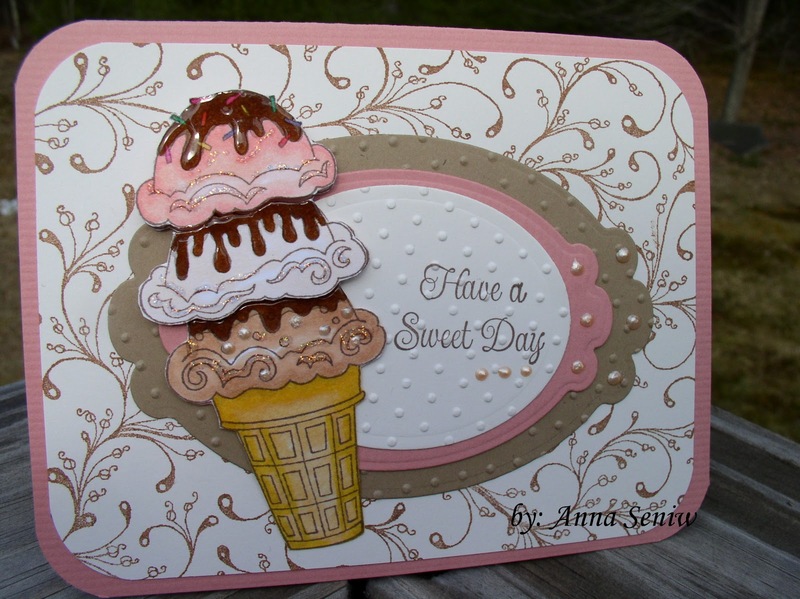 To finish it off I added glossy accents to the syrup, a few pearl accents to the ice cream and the card with the Viva Decor Pearl Pen Salmon color, and of course some strategically placed stickles. This image will be great for all sorts of fun cards. I don't know about you, but it just makes me smile and brings back so many memories! OK Now I'm really ready for spring! Cute card! Love the new blog - so bright and fun.